Last night's Academy Awards show demonstrated that Hollywood is becoming a more culturally diverse place. Actors of Nigerian, Kenyan, and Somalian descent all were up for major acting awards alongside the usual American and European nominees. And while it's wonderful that the film industry may at last be turning a more blind eye to race and ethnicity, as a practical matter there is still a huge difference among actors when it comes to the ease of pronouncing their names. Let's face it, your average Oscar presenter is going to have a much easier time saying Sally Hawkins and Bradley Cooper then Chiwetel Ejiofor and Lupita Nyong'o. Still, the vast majority of presenters and media representatives were able to respectfully and correctly pronounce those exotic (to Americans) monikers. And then there was John Travolta, who, when introducing Broadway star Idina Menzel, somehow turned her name into Adele Dazeem. Travolta's tongue twister immediately became a meme, a parody Twitter account, and a welcome distraction from how overall dull the Oscar broadcast was. And almost a quickly, the good people at Slate.com, who last summer brought us the Anthony Weinergate-inspired "Carlos Danger Name Generator," posted one to generate your very own Travoltafied name. John Travolta may never introduce you at a major awards show, but now at least you know what he would call you if he did. Everyone should experience the honor of having his or her name publicly mangled by a famous Scientologist. John Travolta introduced me once. It was awful. a carnival stuffed bear to be claimed. They should have just let him narrate the whole show. Which is so perfect I want to punch someone in the face. Thank you, Slate.com, for the gift of the Travoltaficationifyer. And John Travolta, thank you for your mangled syntax and your architecturally pure hairline. Hail Xenu. It doesn't surprise me that the Travoltified version of my name isn't as bad as some of the permutations it's gotten. I may even adopt the Travoltified version to avoid ever being asked if I'm "related to that race car driver" ever again. 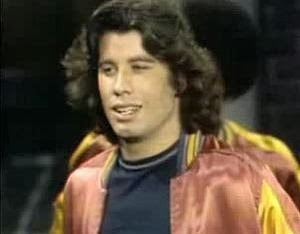 Also I suspect Travolta was trying to imitate Jerry Lewis. It's not much of a stretch. As they get older they look more and more alike. What the hell, it's better than my real name.